Not only is this rush organized, but it’s generous. This is a general rush, meaning you don’t have to be a student to take part. The tickets are $25 a piece (each person can buy two, and the box office doesn’t tack on the usual $1.50 facilities charge). Furthermore, the seats are in the front row, which is a special experience for this show (more on this later). I’ve heard that once the front row is filled, rushers are put in the mezzanine and sometimes a box.A note to rushers: this is one of the most popular rushes and people are getting on line earlier than I have ever seen. Even with Spring Awakening, which was an extremely popular rush, people weren’t getting to the theater as early as they are for Next to Normal. The last time I rushed the show, I did not get tickets (which is the first time I had ever experienced that). This time, I knew I’d have to be really aggressive with my arrival time. I got to the Booth Theatre at 7:20 a.m. and I was still sixth in line. So the tip for rushing this show is to get there early—earlier than you normally do. Next to Normal is a dark musical about a woman living with bipolar depression and how her family copes with it. It is striking that a show in these economic times would dare work in themes that aren’t exactly a draw for tourists or families. But Next to Normal is a work of art that sets out to touch people with its emotional messages and crushing performances. Brian Yorkey and Tom Kitt have crafted a show that is mostly sung through and vibrates with a pop/rock score. The songs not only seep into the heart, but they’re infectious. “Superboy and the Invisible Girl” could be played on the radio. The score allows for loud, raucous moments, as well as quiet, intimate ones, such as the beautiful Act I closer “A Light In The Dark.” Although the lyrics sometimes stumble through some Jonathan Larson-type slant rhymes (“You’ve got some nerve, Henry / And I’m just all nerves), the words are pumped with enough angst and heart to cut through and make a lasting impression. As Diana, the mother grappling with crippling amounts of inner turmoil, Alice Ripley gives the best performance in a musical by an actress that I have ever seen. To quote a friend, I have never before seen an actor who acts all the way down to her toes. Ripley gives an incredibly raw and earnest performance and lays herself naked in front of the audience. She cries numerous times throughout the show, and it’s a wonder that she has enough energy to keep herself standing during the curtain call. Between her vacant stares, worried glances, and angry leers, watching Ripley’s eyes is a wonder. For this reason, sitting in front row rush seats provides one of the most fascinating theater experiences. But even from the back row (yes, I’ve been there) it’s not difficult to watch Ripley tear down her house of cracked emotional walls with her searing vocals. With just one note, she can make an entire song. Although Ripley’s performance is extraordinary, she doesn’t dominate the stage, but shares it with an equally perfect cast. J. Robert Spencer is heartbreaking as Dan, the father, who is so desperate to be the glue that keeps his family together. His performance is infused with heartbreaking optimism, and while he is able to exude charm, he also conveys despair. Jennifer Damiano, who at 18 years old is showing an amazing knack for getting cast in Broadway’s best (she was in the original Broadway cast of Spring Awakening), plays Natalie, the sarcastic and overlooked daughter. At first, her character seemed a little whiny and I found myself eager to get through her scenes so we could get back to the parents. But after seeing multiple performances, her caustic wit has become much sharper and not only does she garner big laughs without fail, but Natalie now comes off as the family member that sees things the clearest. (Read my interview with Damiano on Mother’s Day for Time Out New York.) Aaron Tveit plays the elusive son, Gabe. His vocals are nothing short of amazing, all while playing a very physical role. Tveit is currently on sabbatical from the production while he is playing the lead role in Catch Me If You Can while it plays its pre-Broadway run in Seattle, and filling in the role is Kyle Dean Massey. Massey is a mere shadow of Tveit’s Gabe. He looks like Tveit’s twin, but lacks the vocal momentum on his higher notes and sports only two facial emotions throughout the entire show. Tveit’s September return is eagerly awaited. Adam Chanler-Berat and Louis Hobson are the only two characters that aren’t members of the family, which puts them at a disadvantage. Their characters don’t get a lot of depth—they are there purely to assist their counterparts. That said, both actors take the little they’re given and make the most of the time they have. As Henry, Natalie’s loyal-as-an-old-dog boyfriend, Chanler-Berat is puppy-dog cute and makes the most of some great lines. And Hobson, playing the dual role of Diana’s two doctors, masters the stoic exterior of a logic-taught physician, but makes evident a much deeper caring for Diana with his eyes and strong vocals. It’s not only the score and the performances that make Next to Normal sharp; it’s also the set and lighting. The Goodman’s suburban home is a three-tiered industrial set, fashioned with blue low-wattage light bulbs. Kevin Adams, who illuminated Spring Awakening and Passing Strange, makes Next to Normal an electric spectacle at moments. Mark Wendland’s design of the Goodman’s home is effective in portraying a house, yet doesn’t scream the simplicities of a clichéd stage home (couch, wallpaper, picture frames, etc.). Furthermore, the house’s three levels not only serve as traditional stories, but as metaphorical planes that the characters inhabit at different moments of their mental state. 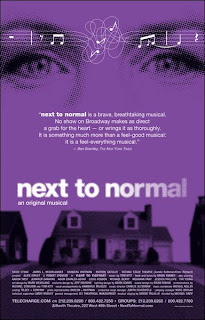 Next to Normal uses the musical genre to enhance its story better than most musicals. Unlike Billy Elliot where the songs cheapen the dramatic plot, Next to Normal uses its songs to sadden, induce anger, frighten, and uplift. This show goes out on a limb and deals with some pretty scary issues. Although depression and grief are the main topics on the table, the deeper message is that we are not always in control of destinies, and we never know when something could come along and change our lives forever. This musical stands as something that most musicals are unable to be: important.